It’s the fall of 1979 in New York City when twenty-three-year-old Anton Winter, back from the Peace Corps and on the mend from a nasty bout of malaria, returns to his childhood home in the Dakota. Anton’s father, the famous late-night host Buddy Winter, is there to greet him, himself recovering from a breakdown. Before long, Anton is swept up in an effort to reignite Buddy’s stalled career, a mission that takes him from the gritty streets of New York, to the slopes of the Lake Placid Olympics, to the Hollywood Hills, to the blue waters of the Bermuda Triangle, and brings him into close quarters with the likes of Johnny Carson, Ted and Joan Kennedy, and a seagoing John Lennon. But the more Anton finds himself enmeshed in his father’s professional and spiritual reinvention, the more he questions his own path, and fissures in the Winter family begin to threaten their close bond. 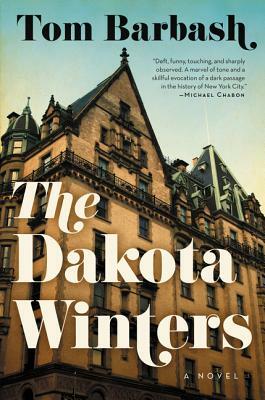 By turns hilarious and poignant, The Dakota Winters is a family saga, a page-turning social novel, and a tale of a critical moment in the history of New York City and the country at large. Tom Barbash is the author of the award-winning novel, The Last Good Chance, which was was awarded the California Book Award, and the short story collection Stay Up With Me, which was a national bestseller and was nominated for the Folio Prize. His nonfiction book, On Top of the World: Cantor Fitzgerald, Howard Lutnick, and 9/11: A Story of Loss and Renewal, was a New York Times bestseller. His stories and articles have been published in Tin House, McSweeney’s, VQR, and other publications, and have been performed on National Public Radio for their Selected Shorts Series. He currently teaches in the MFA program at California College of the Arts. He grew up on the Upper West Side of Manhattan and currently lives in Marin County. “Suffused with warm memories of punk clubs, the “Miracle on Ice” U.S. Olympic hockey team, young romance, and the A-list residents at the storied Dakota apartments.... Pleasurably endearing for anybody with a soft spot for pop culture, Annie Hall-era Manhattan, and 20-somethingdom at its most freewheeling.